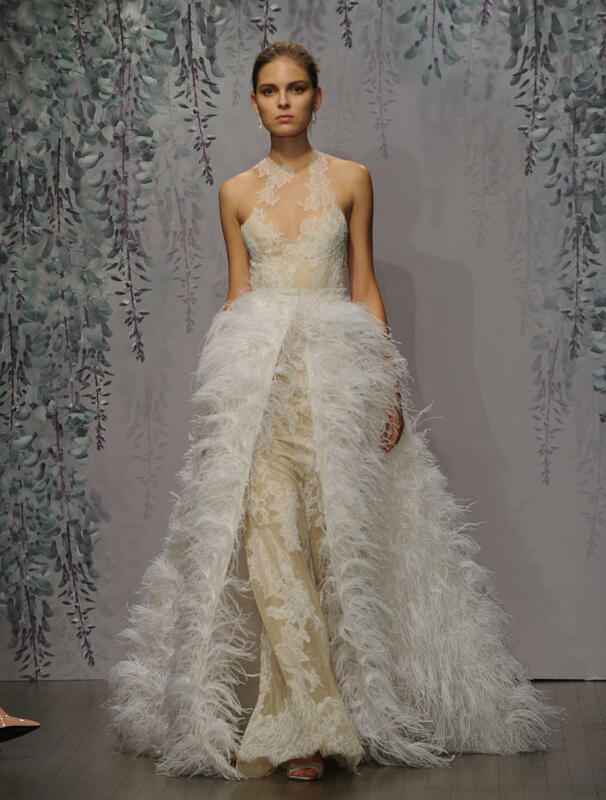 This year, Bridal Fashion Week coincided with Tax Day and Earth Day. Unless your job depends on it, you may have missed the lavish event. Were you buried in old receipts? Busy wondering if you want to attempt taxes yourself? Maybe you went green for the day and turned off the tele. Lucky for those who missed out, following anything and everything wedding IS our job; so we listened, we watched and we Instagram stalked. 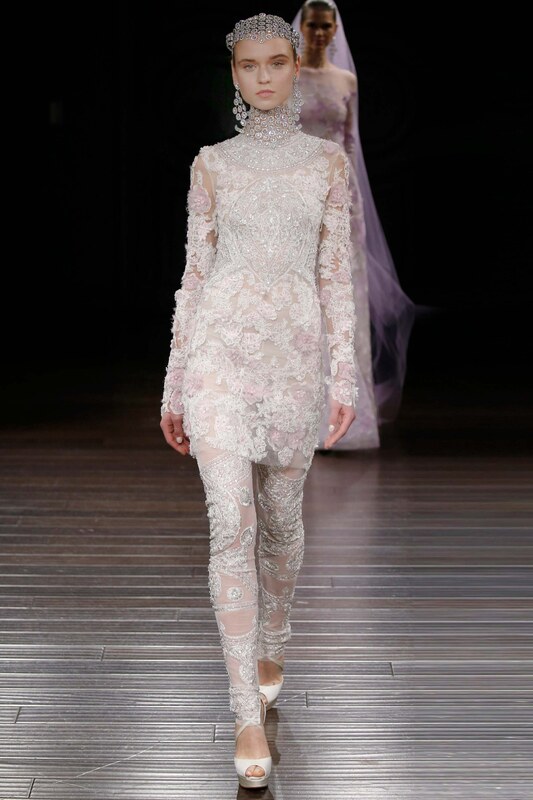 Alas, we present you, the top 10 trends from Bridal Fashion Week. You probably saw it coming. 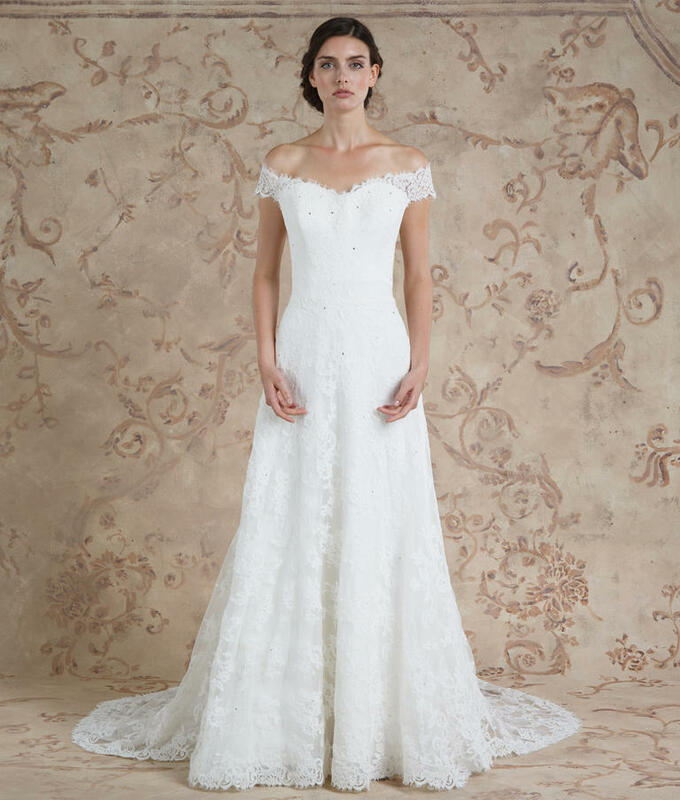 Whether you were circling your way through the dizzying collection of fast fashion that is Forever 21, or perusing the racks at Nordstrom, a beautiful dress with a neckline you’re not sure your mother would approve of likely caught your eye. 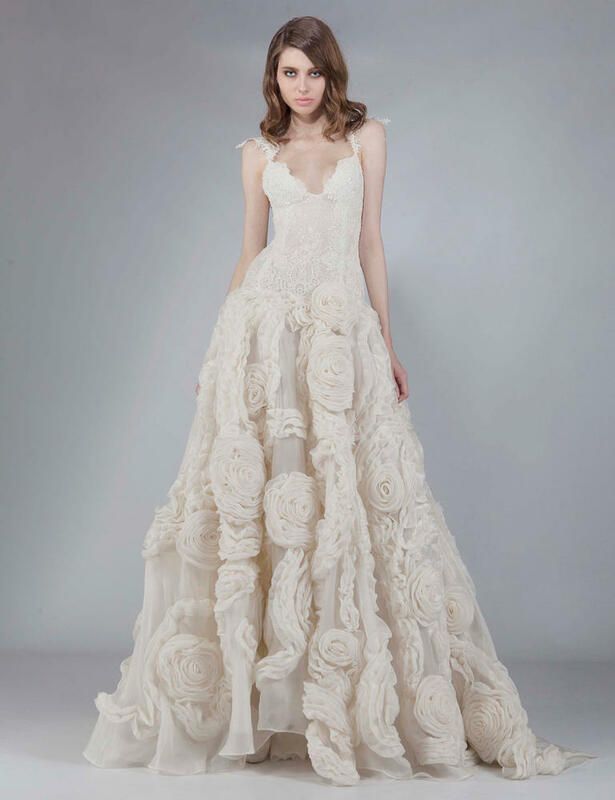 Dying to don this trend on your big day? No matter your style, your options are endless. 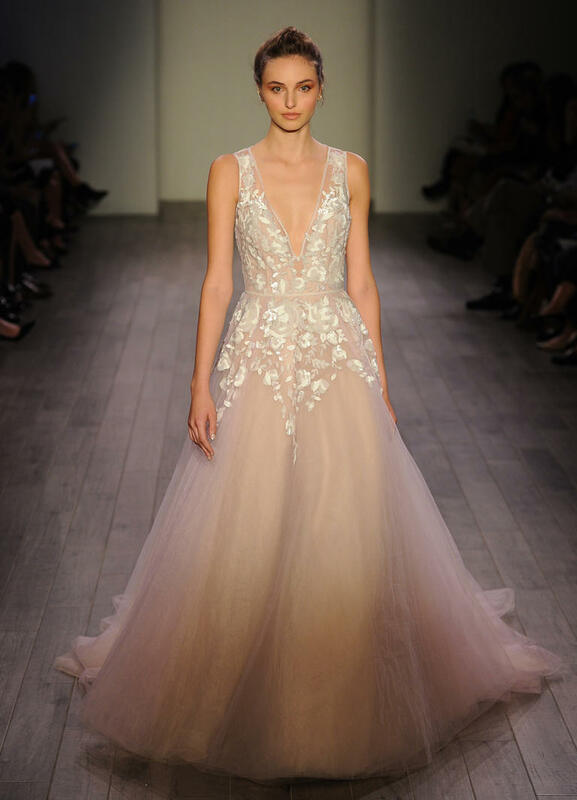 Plunging necklines were found on the runways of Oscar de la Renta, Lela Rose, Marchesa and so many more. These aren’t your average slacks. 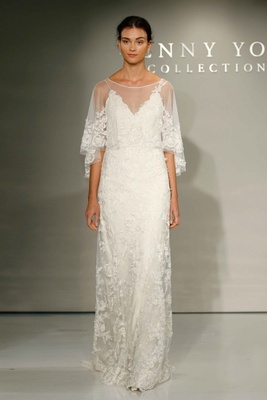 Designers such as Alice Temperley, Angel Sanchez and Naeem Khan took separates to the next level this year. Wide legged pants, fitted trousers, lace leggings and satin suits stole the show. If you feel most beautiful in pants, or just want to go with something more unconventional, then go ahead — say yes to the dress (pants). This is one of those trends that really pops out at you – No, seriously. 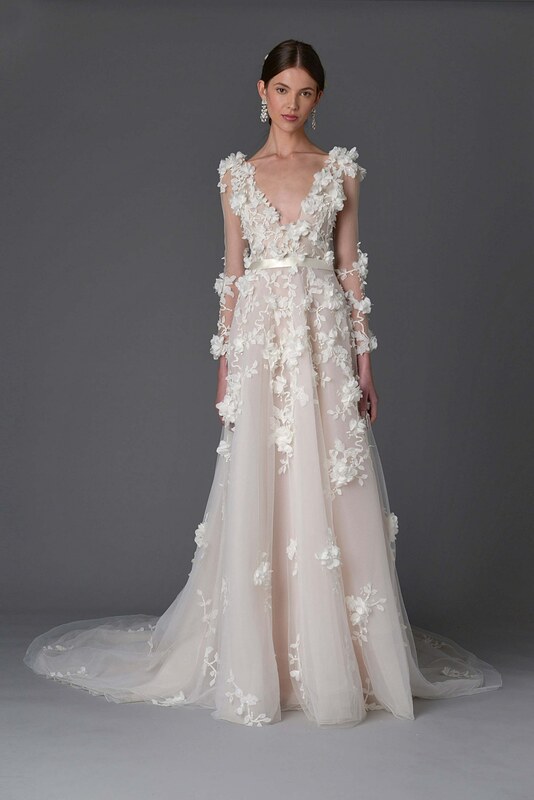 At first we thought “Floral appliques? Been there, done that”, as countless designers took this timeless bridal trend into modern day, but one did it better. 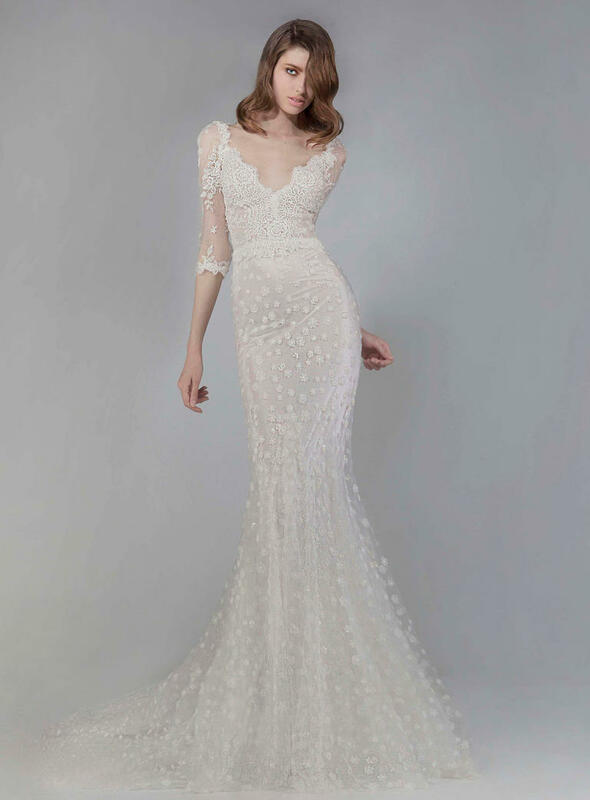 Victoria KyriaKides has begun a wave of bold brides reaching for her gowns, which feature petite polka dots, voluptuous roses, and intricate beading. 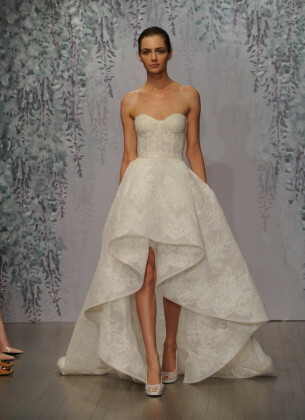 High-low hemlines have been around for awhile now, but not often on the runway of a bridal show. If you’re looking for a wow factor that’s perfect for showing off your designer stilettos, this trend may be for you. 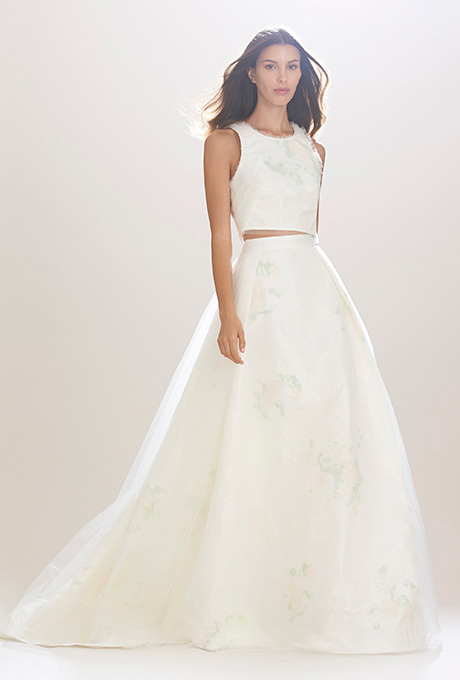 Moreover, if you’re having an outdoor wedding, this hemline may prove to be functional as well as fashionable. Several variations of this trend have popped up on the runways of Carolina Herrera, Monique Lhuillier and Ines Di Santo. Cream, stark white, champagne, ivory, candlelight — the options are endless, but why stop there? This year, several designers stirred things up by putting some color on the runway. The colors are still muted, light and beautiful, but for the bride itching to make a statement, color may be the way to go. 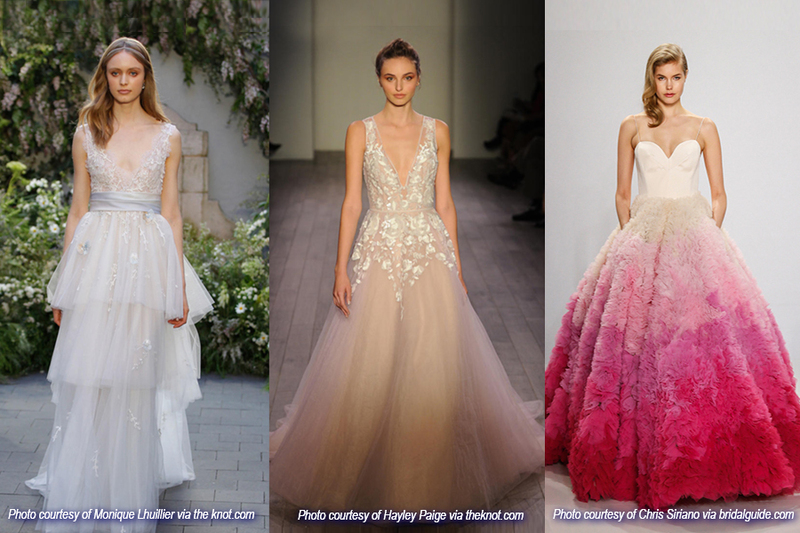 Keep it subtle or wow your guests with a loud pop of color by looking to designers such as Monique Lhuillier, Hayley Paige and Christian Siriano. Cropped tops are nothing new. You see them in the summer, you see them in the winter, at work parties, barbecues and brunch, but at a wedding? On a bride? We say YES. When designers such as Don O’Neill, Carolina Herrera and Sarah Seven do cropped tops they are classy, cute and figure flattering. 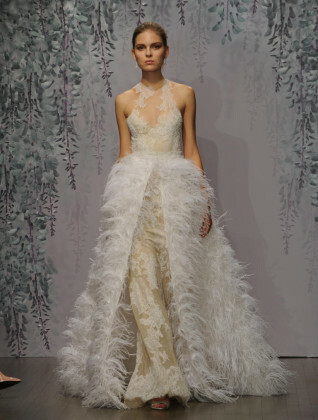 Follow the lead of Monique Lhuillier, Lela Rose and Marchesa, and go for a gown decked out in feathers. These designers threw a few on their gowns and the results? Stunning. So go ahead, shake your tail feather. When you were a child, your mom tied bows in your braids. You soon learned to loop your shoelaces into perfect bows. Each year your birthday gifts were wrapped in bows. This year, brides are gliding down the aisle in gorgeous gowns, tied together with a beautiful bow. 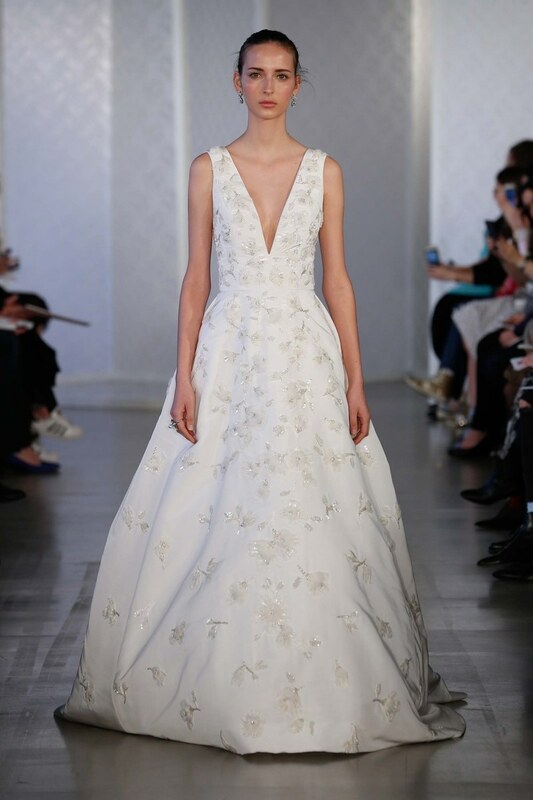 Carolina Herrera made this timeless trend a regular on her runway! This trend has been showing up everywhere lately, so it’s no surprise the likes of Rosá Clara, Sareh Nouri and Marchesa put it on the runway at Bridal Fashion Week. It’s romantic. It’s unique. It’s number nine on our list. To cap off 10 trends? Capelets. When a piece of clothing is so practical, it’s hard to call it fashion, but these are beautiful! It might keep you warm, it might keep you modest, it might just be beautiful. 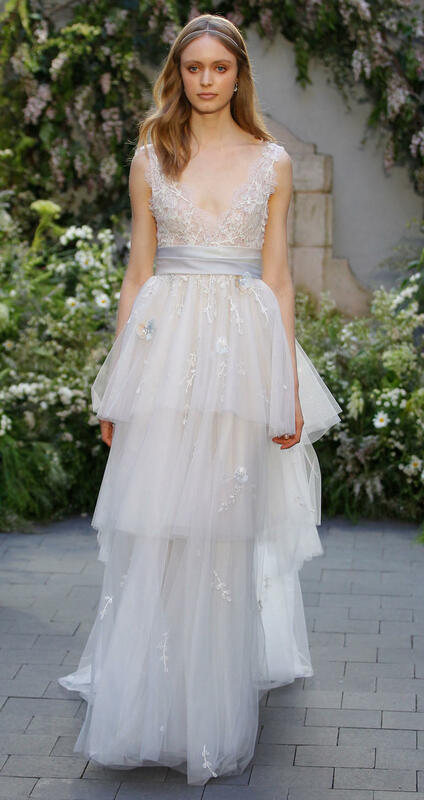 You don’t need a reason when designers like Monique Lhuillier, Jenny and Lela Rose are producing show stopping capelets.